I’ve had two brides so far this week who are wearing their hair down and finishing their look with a sparkly headband. One of my brides had a question about how tiaras and headbands are worn with down hair and what the look is like. There are as many variations to wearing the hair down as there are for wearing it up. Some want a “look”, glam, romantic, or sleek and modern while others want to do what works best for their hair type. Very long locks like the two featured here are so much fun for me to experiment with! Here Brandi’s thick dark hair was styled straight and sleek. In her case there wasn’t too much else we could do because of her volume of hair and our time frame. I love her look and the gorgeous contrast dark hair provides for the sparkling Barcelona Headband. Subtly sparkling with hundreds of tiny Swarovski crystals this vintage inspired piece is beautiful worn like a headband. It really was a perfect way to tame Brandi’s hair and keep it off her face. 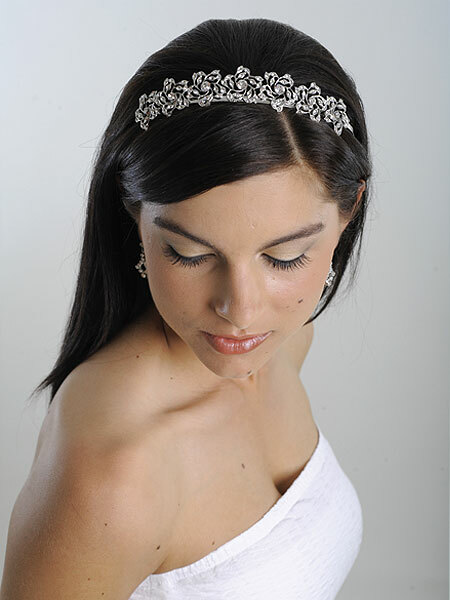 To wear this piece like a tiara in front of up hair we would add a small comb on each side of the headband. Audrey’s hair was another example of a girl with an amazing amount of hair! Wow, we were really a bit stumped at first about how to create the look we wanted. Kelly Cynkar of the Montgomery Hair Boutique really did a great job rolling Audre’s hair into loose romantic curls. I really loved the honey tones in her hair and thought curls would be perfect for her! 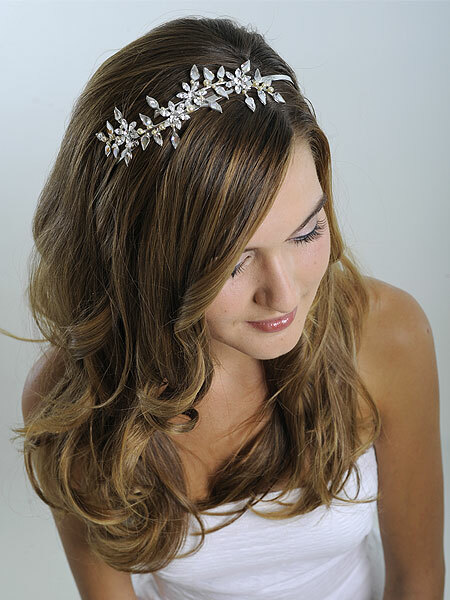 The Lillian Grace Headband an absolutely perfect fit for this look- it’s flowing design of Swarovski crystal pear leaves, daisies, and pearls is asymmetrically placed making it a beautiful choice for soft and romantic hair. This shoot took place last summer at the studio of the fabulous photographer Neysa Ruhl. If you live in the Cincinnati area and are getting married you should check her out, but give yourself plenty of time, her calendar looks like she’s already booked for 2009! Neysa Ruhl has a blog where she regularly shows her current projects. Go on over and see her talent- you’ll be glad you did! Make up was done by Leisa Glevicky of iMakeup Artistry. I’ll be posting more hair styles and talking about how to adorn them, in fact I think there may be a port two to the long hair look! Tell Me: How are you planning on wearing your hair for your wedding day?